Your customers have a problem, and it's an opportunity for you! Take a drive through any neighborhood in your trading area and you'll find hundreds of homes with decks or patios which are unusable much of the time due to the heat and glare of the sun. Conventional awnings are not the answer. They shade only a small area, and they are highly susceptible to wind damage. Instant, retractable shade for any size area. 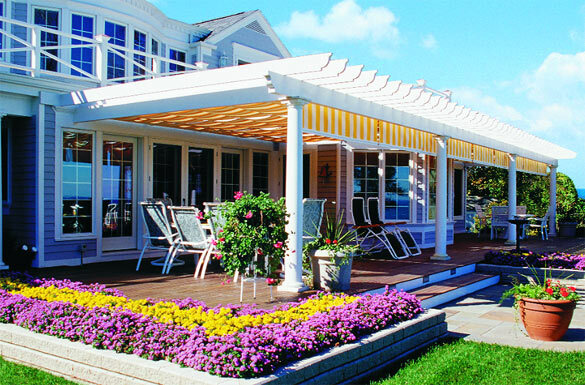 ShadeTree® Retractable Canopy Systems are custom-made to provide refreshing shade in only seconds. They can be retracted just as quickly to allow the sun to penetrate when desired. The canopies ride smoothly in overhead tracks that are supported by handsome structures in the customer's choice of architectural styles. And if left open and unattended during a windstorm, a patented wind protection mechanism releases the canopies to float freely in their tracks. Because of their modular design, no area is too large or too small, or even too oddly shaped to be accommodated by a ShadeTree System. Free design help is available for each customer, including measurement of the area and creation of a computer generated system plan. A great way to generate sales - with no significant investment! · Fast Install & Easy Money - pre-cut & predrilled - averages $100 per hour! · Product shipped directly to customer - no extra handling! · Several display options and selling materials available. Larger displays create an "outdoor room" over existing patio furniture and grills. Smallest display occupies only 4 square feet of floor space. Sign up today to become an authorized ShadeTree® dealer!